In the land of Vikings, a new kind of warrior has surfaced. The Druids. These mysterious individuals are capable of powerful manipulations. Basing their strength on sacred artefacts, they can invoke terrifying creatures and get them to work on their behalf. 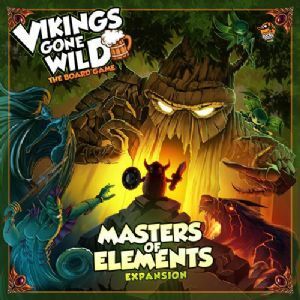 Welcome to Vikings Gone Wild – Master of Elements expansion. This expansion introduces a new type of resource: Elements; All cards from Units, Odin's Path and the newly introduced Artefacts, provide alternative effects triggered with these Elements. This expansion offers a completely asymetric start thanks to 3 permanent Artefact picked through a draft mechanic at the beginning of the game, offering a chance to pick some top card and build a strategy early on.